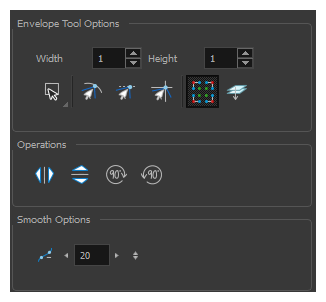 Selecting the Envelope tool displays its properties and options in the Tool Properties view. 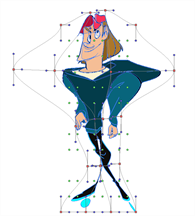 NOTETo learn how to use the Envelope tool, see About the Envelope Tool. 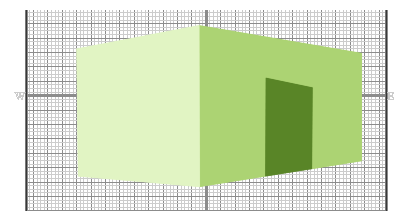 Increase the width and height values to add more columns and rows to the deformation grids. To display more controls,you can click on the Show Advanced Controls button. You can modify the central line smoothness of your line using this option. This parameter smooths the deformed lines. Increasing the value will result in a smoother line with fewer control points. The more you increase the value, the less details and curves you will get. Use the left and right arrows to increment the value by one full unit. Use the Up - Down slider to quickly increment the value.